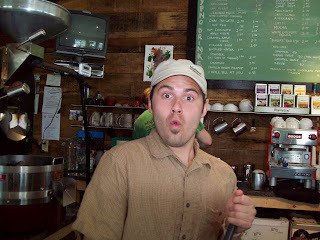 hypnocoffee; coffee roaster, coffee bar: Readying The Deck, Sir! "Oh, no you didn't just say swab the poop deck?!" Being swept up in the siren song of summer I made haste for Oakland yesterday while Bish manned the deck, and I purchased a couple of out-of-doors bistro sets for our deck. Turns out I need to pony-up for a couple more, as the deck swallows just two (2). This is a statement of fact and not just bragging about the size of my deck. Come see for yourself and you'll agree. HypnoFriend Mackie finally made it home after last week's kegger and is officially taking his place in Davis again. Welcome home and now let the conspiracy theories fly! Perhaps Mackie isn't at WVU at all, maybe he's part of the Sons of the Allegheny Militia and Anti-Federal Government Sleeper Cell? Plotting against the intrusion of Wilderness lands? We've got our eye on you Mackie, watch it! Pre-buzz newsflash... even more of our community shall be on TV in the near future. First the not-so-bizarre Willie (of Mountain State Brewery fame) appeared on Bizarre Foods and next...? Stay tuned for the next television appearance by your local stars.